A vicar’s corpse lies slumped waist-deep in a pool of filthy sludge. Michael hasn’t killed him, but what he’s about to do to him is far, far worse. Guards are approaching, and Michael needs this man to not be a vicar anymore. So he dumps a gallon of hydrofluoric acid over the vicar’s face. The acid burns a dozen gaping holes through the vicar’s face, twisting his visage into a mug any horror costume designer would be proud of. It’s not enough, apparently. The vicar still looks recognisable. And so Michael does what any man pushed to the edge would do; he slices the vicar’s face off with a shard of glass. There; what a picture. No one’s going to recognise him now. As I watch Daedalic Entertainment show off Dead Synchronicity’s vicar mutilation puzzle, I feel an odd sense of stomach-churning sickness that I’ve not experienced whilst playing a game before. This is, without question, the most awful thing I’ve ever seen in a game. And then I had to laugh – that nervous, ‘please God stop’ kind of laugh – as things got even bleaker. 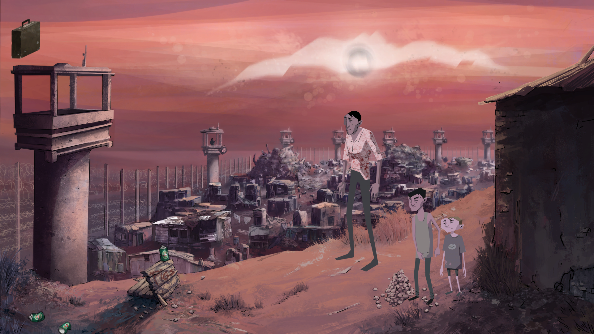 Dead Synchronicity: Tomorrow comes Today is a dystopian point and click adventure from tiny Spanish developer Fictiorama. It’s deeply traditional to the point of feeling archaic, and fits in perfectly alongside Daedalic’s collection of adventure games. The 2D art is somewhat crudely animated, but it fits the ramshackle nature of this awful, decaying world. It’s a land catapulted into the apocalypse by the Great Wave, a series of natural disasters that’s left everything looking a bit like Fallout, and spread a plague that causes victims to decompose into puddles of blood. Taking advantage of this state of panic and distress are a militaristic force that’s got the whole place locked down like it’s 1984. They’re stationed all around the inhabited zones of the world, eyeing up the population from tall watch towers. It’s close to one of these watchtowers where the puzzle I’m being shown starts. Michael – Dead Syncronicity’s player character – needs to remove a guard from a tower, and does so by borrowing a catapult from a couple of kids close by. The rock sails into the guard’s cranium, knocking him from the crowsnest and plummeting him to his death in the river below. As with all adventure games, one puzzle creates another, and now Michael needs to cover up his involvement in this murder. Enter the dead vicar, our convenient fall guy. Michael plants the catapult on the newly discovered corpse, but realises that a vicar having ownership of a catapult doesn’t really lead to conviction. Who’s going to believe that this warm, friendly man of the cloth would send a soldier to his doom? The only option is, naturally, to disfigure his face so no one knows who he is. A few minutes later, the vicar’s face is an open wound and I’m very close to painting my notebook with the remains of my lunch. With the murder evidence successfully planted, Michael wanders off to another part of town. Dead Synchronicity has a linear narrative, but generally you can complete its puzzles in whatever order you fancy. I’m not sure you could prioritise them by any factor of joy though, in case you were hoping to save the least depressing until last. For example, after pouring acid over a christian’s face, Michael then went to explore ‘Suicide Pact’, an area of town where people go to snuff themselves. Thanks to the tight gun control in the area, people looking for a way out of Dead Synchronicity’s awful world generally turn to the rope. Suicide Pact is a densely wooded region where from every branch hangs a decomposing corpse. 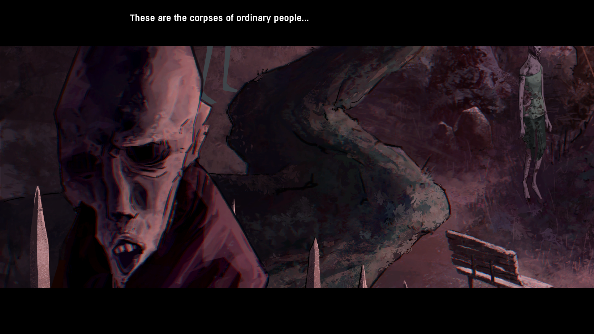 Not content to just show off lifeless bodies, the game proceeds to illustrate tormented souls in their final moments thanks to Michael’s new-found ability to experience flashbacks of his surroundings. He hangs around like a rubber-necker at a motorway incident as the dead body on the ground stands back up, ties the length of rope around his neck, and swings from the highest branch until his neck snaps. These flashbacks reveal secrets in the area that may now be concealed in the present day, but I think I’d rather have just had a good hunt around, thanks. 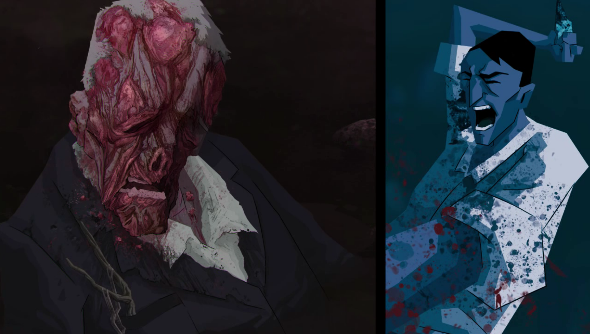 Dead Synchronicity is a bleak, harrowing descent into depression. At no point do you ever feel that there’s an escape from its cruel world. Every puzzle is the equivalent of a boot repeatedly slamming down on a baby’s face. If this kind of soul-shattering universe is something you can bear, then Dead Synchronicity may be something you’d like to consider picking up when it releases in May. For all its glumness, there’s an interesting Bourne Identity-shaped amnesia plot at the centre, and a variety of motive conundrums to unravel. The game doesn’t ship with vouchers for therapy though, which should at least be a pre-order bonus.